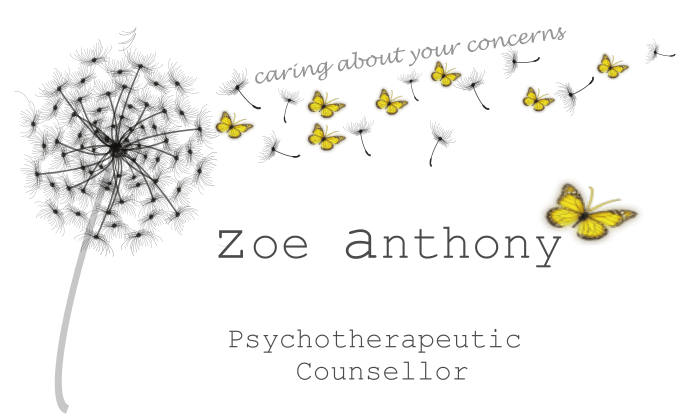 How I Can Help You with Counselling | Zoe Anthony, Ipswich Suffolk. Counselling and psychotherapy is a process of exploration, learning, self-expression and bringing about change. It can help you gain some objectivity and control over confusion or loss of direction which you may be experiencing in life. The support and challenge of counselling can assist in making connections between the past and present by encouraging the exploration and expression of difficult feelings and emotional pain. My work is influenced by the Humanistic Perspective which promotes the capacity for healing and growth primarily within yourself and secondarily within the relationship you have with me. I will help you to explore the ways in which you can have more conscious choice about the way you control and direct your own life. My integrative approach, based upon my commitment to Person-Centred Therapy, allows me to draw from a range of theories, including Cognitive Behavioural Therapy (CBT) and Psychodynamic and Developmental theories. Therefore sessions can be tailored to suit a wide range of issues. My role is to listen, reflect, clarify, summarise and highlight themes and recurring patterns of behaviour. CBT can help you move from ‘stuck’ places of old patterns of negative thinking to a more compassionate and peaceful relationship with yourself. Psychodynamic and Developmental theories can help you gain a deeper awareness of unconscious emotional reactions that may relate to unresolved experiences in childhood. Discovering and acknowledging your inner processes can help to free swallowed and supressed feelings which can rob natural spontaneity and a zest for life. Counselling and psychotherapy cannot change the past but it can help you to hope for a better present and future. Whatever your reasons for considering counselling, it will give you the opportunity to move forward in your life. to email me or telephone 07855 763073.